As new web developers bring their website online, many wonder about SEO and why it is needed for a website. That’s a logical concern: Even when signing up for a web hosting package, many are confronted with offers of a free SEO consultation, bonus credits for search engine ad placement, and numerous other services that promise to put the fledgling website front and center in future search queries. Is SEO really that important, though? Should a website embrace SEO over things like social media marketing and promoted posts? The answer to these questions is a resounding “yes,” and there are a few key reasons why. First, What is Search Engine Optimization? 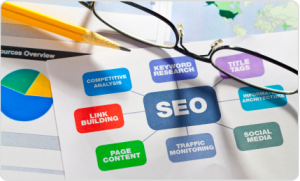 SEO is the process of making a website highly visible on search engines like Google, Yahoo, and Bing. This is done in several ways, the most notable of which is the creation and publication of authoritative and helpful content that will draw users in. SEO algorithms also look for certain keywords that match popular search queries, and they increasingly look for high levels of user engagement as a sign that the website has a broad audience and the potential to help new visitors. Search engine optimization also focuses on creating links between websites that show an “endorsement,” usually through guest blog posts or other means. Though each of these things is easy to do, and typically won’t cost a website owner anything extra, there are a few major benefits to engaging in good SEO practices. Good SEO allows a website to be on the first page of search results, often at or near the top. To users, this looks like an endorsement of the website by their most trusted search engine. They’re more likely to click through, and that means the website essentially gets free publicity just for adhering to the best practices of SEO. The free publicity mentioned earlier is great for bringing users to a new website and engaging them with a new source of authoritative content. It’s also great for something else: Higher conversion numbers and advertising impressions. Websites increasingly rely on advertising to pay the bills, and a greater pool of users to choose from means that ads are more likely to be seen and clicked. This helps increase revenue, which helps the website stay online and even increase its presence. The typical website is more than just a website. It’s also a Twitter account, a Facebook page, and a Google+ experience. With proper SEO, enterprising site owners can make sure that all of these destinations come up on the first page of a search result. Users won’t just be presented with a single website. Instead, they’re presented with the full online experience of an authoritative site. They’re more likely not only to click through to the website, but to become dedicated followers of the site’s social media presence. This helps create loyal users more efficiently and cost-effectively than virtually any other means. Search engine optimization can mean the difference between a site that no one has ever heard of, and one that is almost instantly useful and popular to a large audience. That’s the real impact of SEO and why it is needed for a website of any size, according to Moz.